By rule, the pitcher is charged with a balk while in contact with the rubber when he throws to the first baseman or third baseman who is either in front of or behind the base and obviously not making an attempt to retire the runner at that base. Several years ago the rule was only directed at the first baseman but was subsequently changed to include the third baseman. In the Yankees- Orioles game on April 8, 2017, in Baltimore, the Yankees had runners on first and third and two outs in the top of the fifth inning with Kevin Gausman on the mound for the Birds. Gausman attempted to pick-off Kevin Romine at third base. But his throw was ruled a balk because third baseman Manny Machado was so far from the base (15-20 feet). The duo of Gausman/Machado could not be considered as making an obvious attempt to retire Romine. While Machado appeared to take a late step toward third as he was receiving the ball, he was still approximately 15 – 20 feet from the base and umpire Tripp Gibson called the balk. To view this balk, go to the link below. It should be noted that there is no violation if the pitcher attempts a legal pickoff at second base, and seeing no fielder covering the bag, throws to a fielder, who is neither in the vicinity of the bag nor making an actual appeal attempt to retire the runner. Also, there is no violation if the pitcher throws to a base when the fielder is not covering. 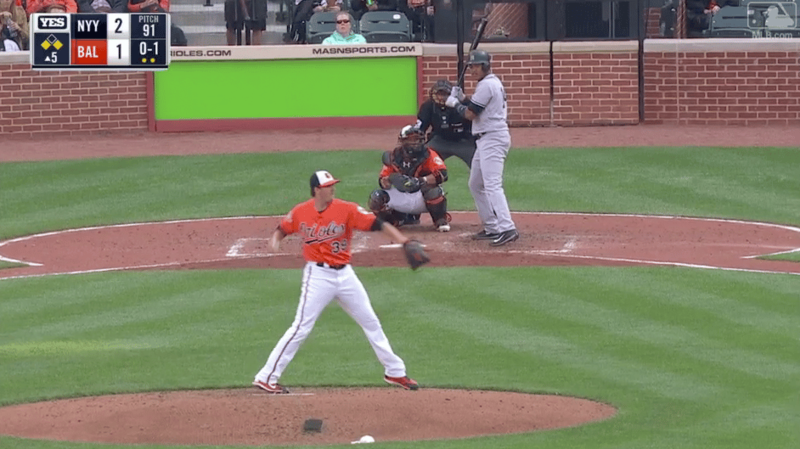 If in the above play, Gausman threw to the uncovered base, there would be no violation. Of course, the throw would have been an errant and runners would have advanced at least one base the same as the balk penalty anyway. Thus, the runner is still protected which is the purpose of the balk rule. Controversial Balk Call, Braves vs Phillies Did the Umpire Misinterpret Backswing Batter Interference?